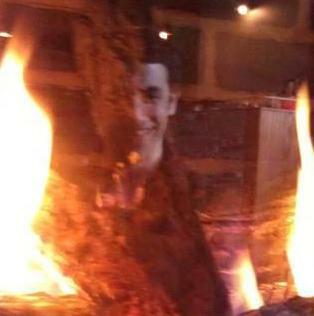 There’s just something infernal about being seen through flames, no? Dan entered the world in the summer of 1989, and—aside from the affinity for The Beatles he inherited from his mother—spent the majority of his youth making a series of ill-advised musical decisions. The Backstreet Boys, KoRn, Sum 41…you name it. If there was a crap artist, chances are he was into it. That all changed when he hit eighth grade and Grand Theft Auto: Vice City entered his life. While driving around during one of the game’s missions, he switched to the V-Rock radio station and heard Iron Maiden’s “2 Minutes to Midnight,” and thus, a new metalhead was born. Shortly after arriving at Syracuse University to study journalism, Dan met fellow metalhead Corey, and a friendship was born. The friendship lasted (the guys eventually co-founded a fake, heavy-metal-themed fraternity called Alpha Sigma Satan), but the journalism did not; before the creation of Nine Circles, Dan had tried to start no less than five blogs, each one lasting less than a month. The podcasting, though…that took a little while. It wasn’t until he acquired his first iPad (he won’t reveal what year, but let’s just say it was embarrassingly late) that his interest in the medium developed. After subscribing to and immersing himself in more podcasts than any sane person should—from WTF to Planet Money to How Did This Get Made? and approximately 20 others—he decided he wanted to make his own. So he rounded up Corey and here we are. Yes, there’s some NOT-metal in there. What’re you gonna do about it? Click here to view all of Dan’s past posts.